Pubic art installed through administration of the ordinance includes permanent installations. Installations include a collection in City Hall, additional pieces in pubic places and public buildings and award winning utility box art program. Completed in 1991 at the Emeryville Child Development Center, Narcissus Quagliata's work, "Untitled," consists of artwork panels installed in the 4 doors of an exterior wall of the lunchroom, opening onto an inner courtyard. 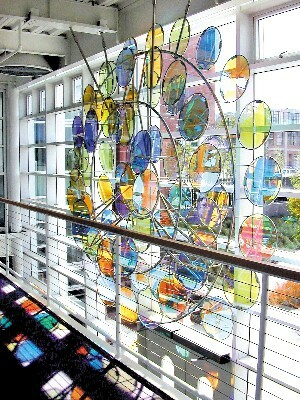 The artwork is made from hand-blown glass, frosted flat glass, tempered safety glass, aluminum framing, and paint. As a municipal development project, the recently completed construction of the Emeryville Civic Center was subject to the city’s Art in Public Places Program, requiring that 1.5% of its development costs be allocated for public art. A selection panel was formed comprised of artist professionals, residents, members of the Public Art Committee, and members of the City Council to review entries and select the final artists. Roger Berry and Sheila Ghidini were chosen from over 50 artists submitting proposals for this project. Both artists used the circular dome of the old town hall building as a starting point and/or counterpoint for their design concepts. Roger Berry, an artist based in Clarksburg, California, designed and fabricated the "Solar Rose" window in the link area between the 2 buildings. The Solar Rose is made of stainless steel and diachronic glass that casts multicolored reflections and shadows in different directions depending on the time of year. Sheila Ghidini, a San Francisco-based artist, created a contemplative seating area in the tree garden area on the south side of the building, called "Three spaces of Respite". The artwork consists of 3 semi-circular seating areas surrounding labyrinths that are sandblasted into the concrete. Ms. Ghidini encouraged participation in her project design by sending a survey to city hall employees and area residents with 6 labyrinth choices, allowing them to choose the final three labyrinths that were included in the design. During the summer of 2005, the artist team "Wowhaus" undertook design development and conducted workshops with the community to develop imagery for the art located at the Doyle Street pocket park. In April 2006, Wowhaus completed the installation of "Look Closely," a series of functional seating sculptures fabricated of pigmented concrete with etched granite insets depicting natural elements that have been placed along several locations on Doyle Street between 59th Street and Ocean Avenue. In the words of the artists, "as pedestrians walk along the Greenway they will be encouraged to slow down, look closely at both the art work and the nature around them." "Look Closely" includes 3 curved benches on the semi-circular path near the Emeryville Community Organic Garden; a circular, central "seat / table"; 5 "touchstones" - boulder-like seating forms; installations of etched granite insets designed by community youth; and a curved bench installed in the landscaped pocket park just north of Ocean Avenue. In 2002, the City of Emeryville selected an artist team comprised of Emeryville-based Vickie Jo Sowell and M. Louise Stanley, and Berkeley-based lighting designer Jeremy Hamm for the commission of artwork under the Powell Street Underpass. The project, conceived by the city’s Public Art Committee, had a main goal of improving the underpass environment to make it friendlier to pedestrian and bicycle traffic. The city received numerous proposals, but the artist team of Sowell, Stanley and Hamm were ultimately selected for their proposal to install eight larger-than-life painted steel figures that represent personalities drawn from the Emeryville population. The added element of evening lighting on the figures allows their silhouettes to be cast dramatically against the back abutment walls of the underpass, which were painted light blue to improve the overall appearance of the underpass and quality of the artwork. The figures include a father and daughter, an Emeryville police officer, a self-portrait of team member Louise Stanley, and tourists looking at an Emeryville map. “Neighborhood Convergence” was one of the more complex projects that the city has undertaken in its Art in Public Places Program, with a total budget exceeding $200,000. The three-year project involved several approval stages from both the city and Caltrans, due to the project’s location on Caltrans right-of-way. It was necessary to bring in electrical power for the lighting; the electrical work was completed earlier this year. The sculptures are supported by 4-foot footings on posts that can withstand 80 mph winds. Bay Area artist Anita Margrill completed and installed "Peninsula Tell-Tail and Overlook" in 1992. The work is a 40-foot high weather vane / solar beacon at the edge of the San Francisco Bay, adjacent to a popular jogging path and the Emeryville mud flats. Hoping to shape the "mystical juncture" between wind, sun and water, the artist explained that she tried "to capture the traditional notion of idiosyncratic weather vanes that reflect a particular time and place - in this case, the Emeryville mudflats, which carve land from the San Francisco Bay at the eastern end of the Oakland Bay Bridge. From here, Treasure Island, against a backdrop of the San Francisco skyline, fills the eye - until one glances down at all the flotsam of modern society that washes onto the mudflats…." Emeryville artist Vickie Jo Sowell was selected by the City of Emeryville to install a new public art work at the Fire Station #2, located at 6303 Hollis Street. This public art project was implemented through the Public Art Committee and a selection panel composed of members of the Public Art Committee, Fire Department personnel, community residents and art professionals. In Fall 2001, Ms. Sowell installed "Pumpers" and "Sparky" at the Fire Station, part of a general facelift for the city property which included repainting the building prior to the art installation, and new landscaping to be installed in Spring 2002. Ms. Sowell's sculptural approach to the project defines the entire Hollis frontage and consists of a 20-foot turquoise enamel steel panel mounted at sidewalk level. This is "Sparky," named for the eye-catching profile of a dalmation fire dog mounted in silver relief. Sparky looks to the right, at 2 panels that flank the gates of Fire Station #2's yard, adding to its privacy and security at the same time that it improves the appearance of the gate. These panels, "Pumpers," are executed in silver perforated metal stock with red enamel steel depictions of the big pumping trucks used in the firefighting world. In 2004, the Emeryville Public Art Committee initiated a project to install public art on many of the city-owned traffic signal boxes (the typically gray-painted utility boxes located at traffic intersections). The city allocated funds from its Public Art Fund and hired Oakland-based artist, Seyed Alavi, after conducting an extensive request for proposals process. Seyed Alavi, a self-described conceptual and interdisciplinary artist, was selected for his proposal to adapt the pedestrian figure well-know in traffic signage into new thought-provoking, engaging, and even playful compositions. The project, titled “Signs of the Times,” involves art work installation on 17 signal boxes located throughout Emeryville. Seyed worked collaboratively with Emery Secondary School sculpture students to develop the thought-provoking imagery that he then adapted into his art work. The student voice comes through loud and clear in “Signs of the Times.” Seyed guided the students though a process of brainstorming, discussion and sketching to develop their ideas into truly profound images. Utility boxes in Emeryville, designed to be invisible, now cause viewers to pause, reflect and see the human condition in a different way. The students volunteered to be a part of this project and met twice a week with Seyed for about 6 weeks to develop their ideas. The students collaborated and critiqued the images until they were confident that their images were what they needed to be. The students gained an understanding of the meaning of conceptual art. The student artists spoke at a City Council meeting when the City Council considered final approval of the project. They now have firsthand knowledge about the approval process for public art. They have a deeper understanding of the relationship between an improved quality of life brought about by public art in their community and their city government that encourages public art. Watch the KQED’s Spark episode on artist Seyed Alavi. Manta” and "Sine Waves" by Michael Greenwald Creations opens March 19, 2016. "Manta" is a skateable art feature and "Sine Waves" is an artistic barriers between the skate spot and adjacent parking.